On Monday, Penn hosts Lin-Manuel Miranda who will be giving this year’s commencement address. His acclaimed musical retelling of Alexander Hamilton’s life has sparked enormous interest in the first Secretary of the Treasury. A few months ago, in reading through scholarship on our collections, I came across a 1941 article describing a set of bound volumes here at Penn which seem to have once belonged to Hamilton himself . 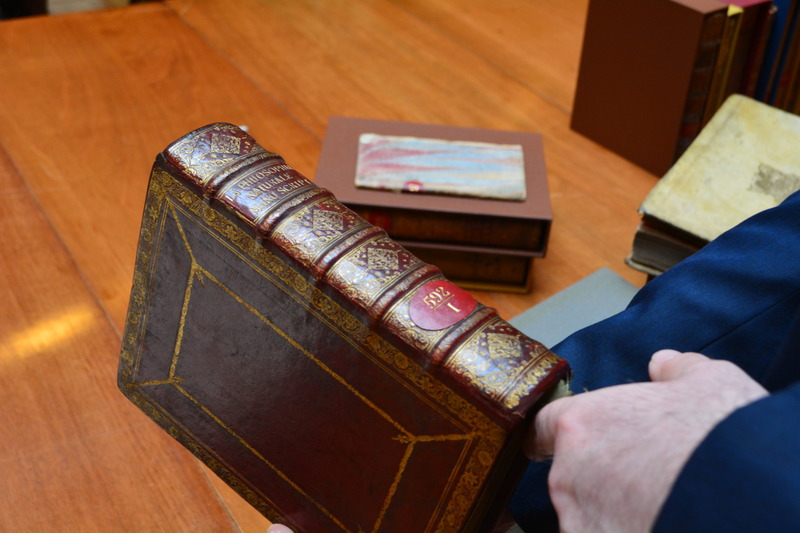 I quickly realized that the two volumes had become separated in our collection, housed in different places and not cataloged as a set or in any way associated with Hamilton. Our excellent catalogers Liz Broadwell and Amey Hutchins got to work and now I’m happy to report that we know a lot more about these volumes. 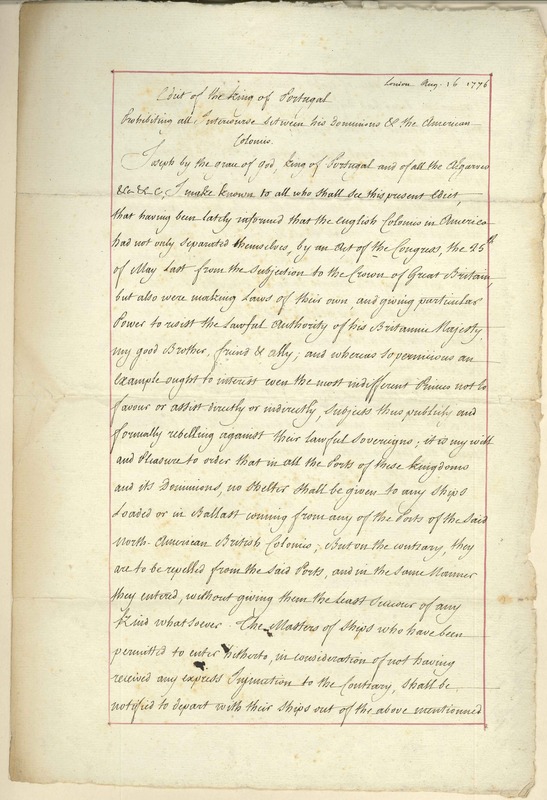 They consist of 48 printed documents from the young United States government dating from 1785 to 1794, as well as two manuscripts, including one possibly in Hamilton’s hand (above), relating to the sale of land in the trans-Appalachian west. (For a full listing see here). It might be tempting to snooze at the thought of a compilation of government documents, but we know from a table of contents which has been identified as being in Hamilton’s hand by one scholar* that these were likely part of his working library and as such reveal the documentary work of governing the new United States. The volumes arrived at Penn sometime before 1899 when they were first inventoried. They were subsequently rebound in a modern library binding and the connection between the volumes was lost for a time. The primary evidence for these having been owned by Hamilton are the table of contents written in what seems to be Hamilton’s handwriting at the rear of the first compiled volume, as well as a manuscript copy of a government document also likely in Hamilton’s handwriting in the second volume. The strongest association though for these documents is to one of Hamilton’s assistants at the Treasury Department, Henry Kuhl (1764-1856), chief clerk of the comptroller’s office. His signature appears on the first document in the set and as he was involved with the early University of Pennsylvania it seems likely this set came to us from his family sometime before 1899. The work of managing the financial affairs of a new country was not easy, the 50 documents in the collection all testify to its complexity. Among them are a series of tables giving trade statistics, a host of reports on the payment of state debts, Jefferson’s report on establishing uniform weights, measures, and coinage in the US, and a set of documents on selling western land to benefit the treasury. What is it that you read when you read a print copy of a magazine in a library or as a digital photograph from an online source? Though plenty of strange things happen to monographs, bindings are removed, plates sometimes missing or not scanned, fold-outs mangled, periodicals are particularly fluid material texts, often intended to be preserved in different formats than they were sold right from the start – think of those shelves of bound journals sitting in the stacks of university libraries, or even your old copy of the New Yorker missing all those annoying subscription cards. With the advent of mass digitization projects like Google Books, the Internet Archive, and Hathi Trust, long runs of periodicals before 1923 totaling millions of pages have been made readily available to the wider world. This is especially important for those who work on nineteenth century literary culture – which, particularly in the United States and Great Britain, depended heavily on the periodical press. Many of the great books and authors of the period appeared first in magazines and journals. The various literary and political periodicals of the day had large subscription bases, sometimes publishing dual editions on both sides of the Atlantic. Blackwood’s Edinburgh Magazine was one of these heavyweights. Published between 1817 and 1905 (and in another form until 1980) in Edinburgh, London, and New York the magazine featured nearly all the great authors of the day including George Eliot whose Middlemarch first appeared in eight issues of the journal . Blackwood’s Edinburgh Magazine. UPenn AP4.B6 copy 1. 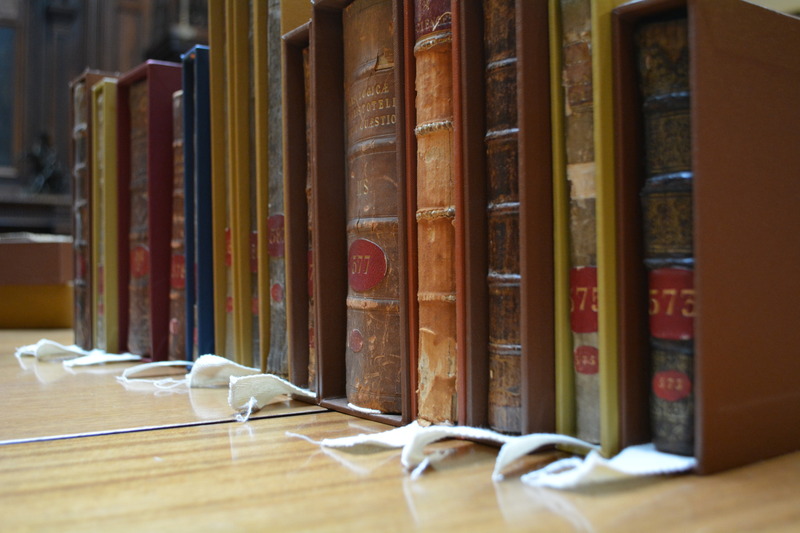 Row of volumes in the Special Collections stacks. The shelves of Blackwood’s at Penn above are pretty typical. Each issue from a particular intellectual “volume” (e.g. volume 48) of the magazine has been bound up with other issues to form a physical volume. The volumes themselves are bound for ready browsing and reading in typical period style and it’s clear that many readers of the day had their own copies bound as soon as the volume was completed. 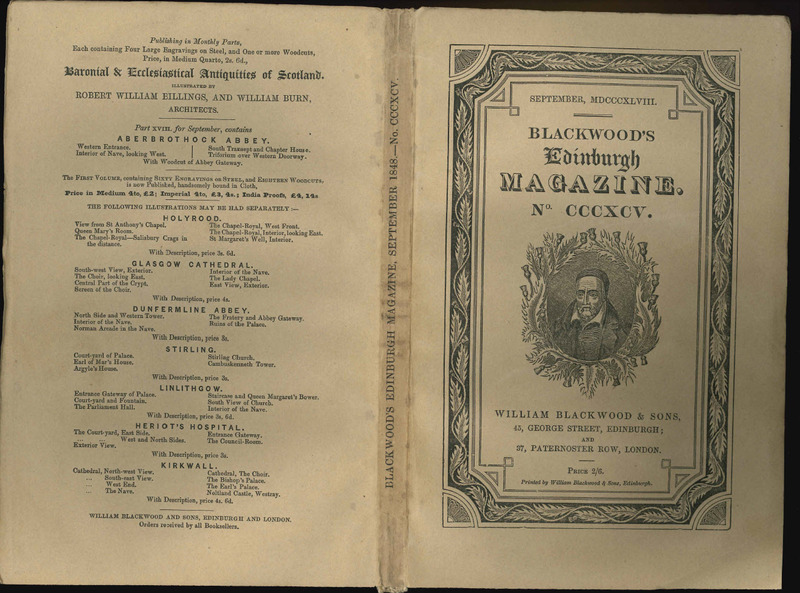 Below for example you can see the final page of text for the August 1848 issue of volume 48 of Blackwood’s on the left with the text for the September 1848 issue beginning immediately on the facing page. Blackwood’s Edinburgh Magazine. UPenn AP4.B6 copy 1 vol. 48. 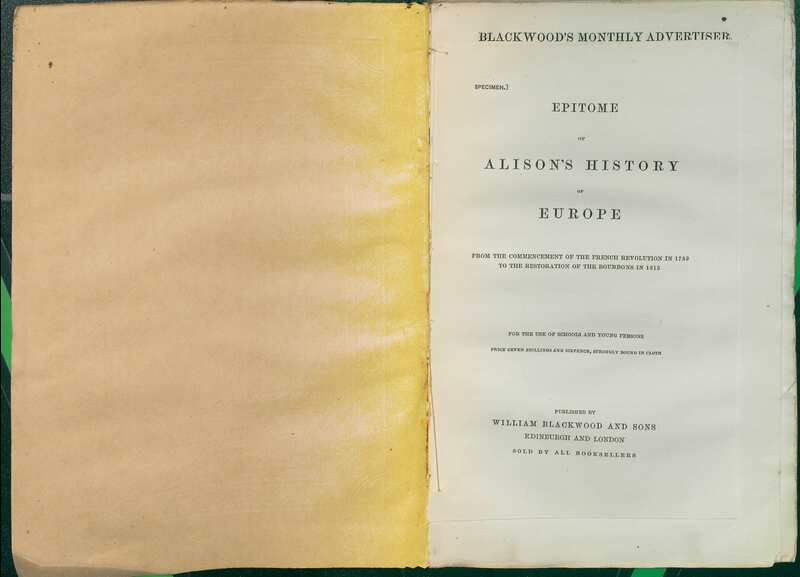 Digital images of the UC-Berkeley,Penn State University, and University of Iowa copies of Blackwood’s for September 1848. This view of the magazine, with one month quickly transitioning to the next, in both print and digital form, represents only one view of the text. The form in which they arrived to readers in the post or at the local bookseller looked quite a bit different. 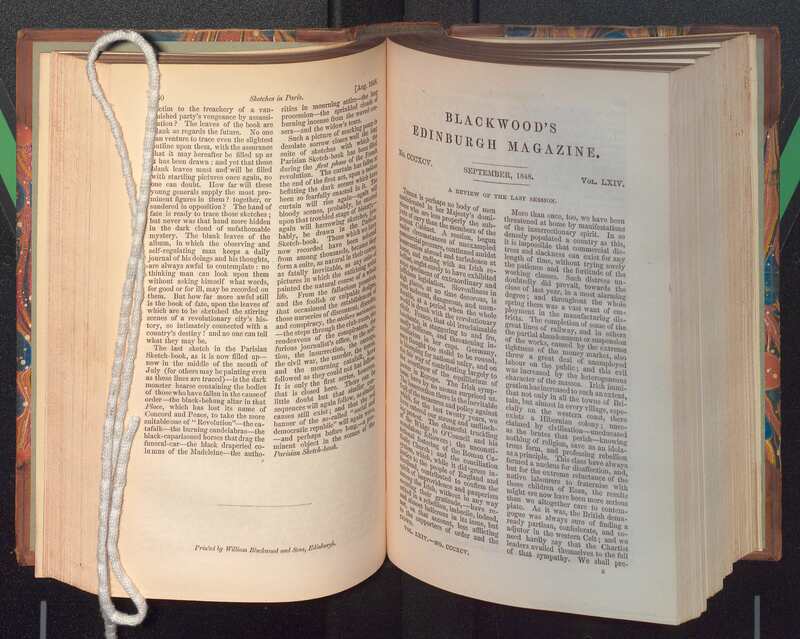 Recently we acquired here a set of six issues of Blackwood’s Magazine which have survived in their original state . Bound in paper wrappers individually labeled with the month of issue and bearing advertisements on the back, these issues also retain a cache of advertising and other ephemeral material excised from all other copies I’ve seen. Blackwood’s Edinburgh Magazine. UPenn AP4.B6 copy 3, issue 395. The start of a new month (rainy and cold here in Philadelphia) has reminded me to write about a new almanac fragment here at Penn. In November of last year, the Penn Libraries purchased a unique and somewhat mysterious eighteenth century manuscript. Consisting of a single bifolium (a sheet folded to make four pages) it was likely produced in Philadelphia (or somewhere else of a similar latitude) in 1746/7. It appears to be part of an almanac containing eclipse charts, predictions for weather, and astrological signs, removed from what must once have been a larger manuscript volume. 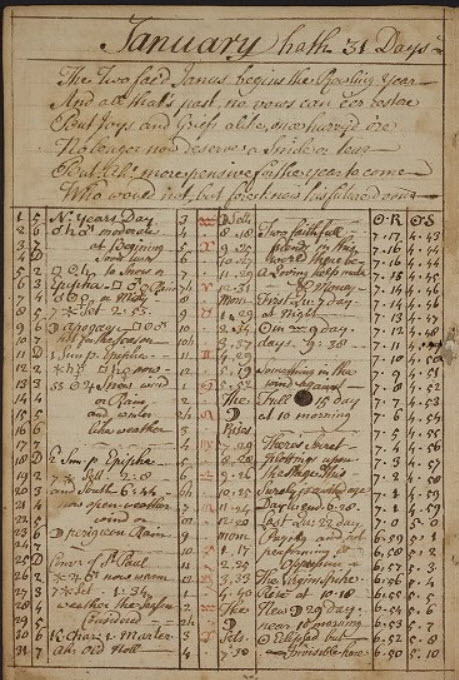 Astronomical and almanac manuscripts from colonial Philadelphia are not common though there was a robust trade in print almanacs and lunar charts throughout the city in the period with at least four different almanacs each year by mid-century . What initially drew my attention to the manuscript was its attribution to David Rittenhouse, the famous Philadelphia astronomer, inventor, and treasurer of the Continental Congress. His masterful 1771 Orrery is today here in the University of Pennsylvania Libraries. To be clear, the attribution of this manuscript to Rittenhouse is decidedly uncertain. 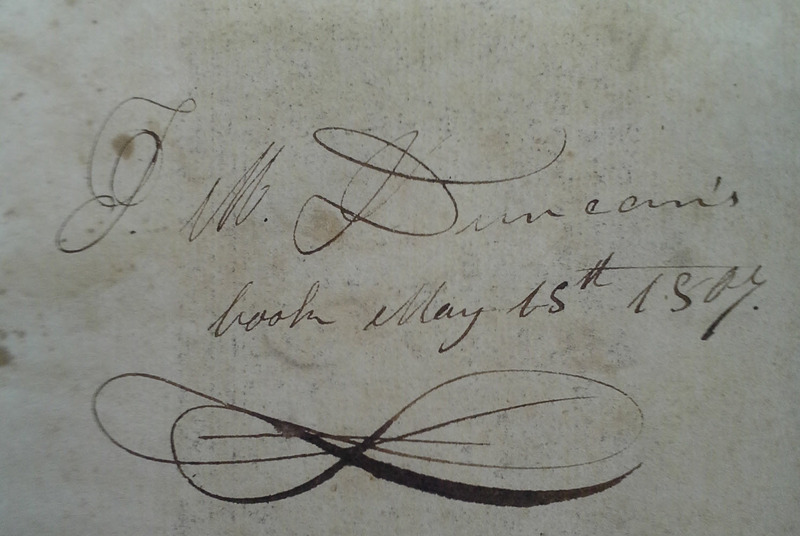 There is a small pencil annotation of unknown date on the side of the bifolium listing him as the author. 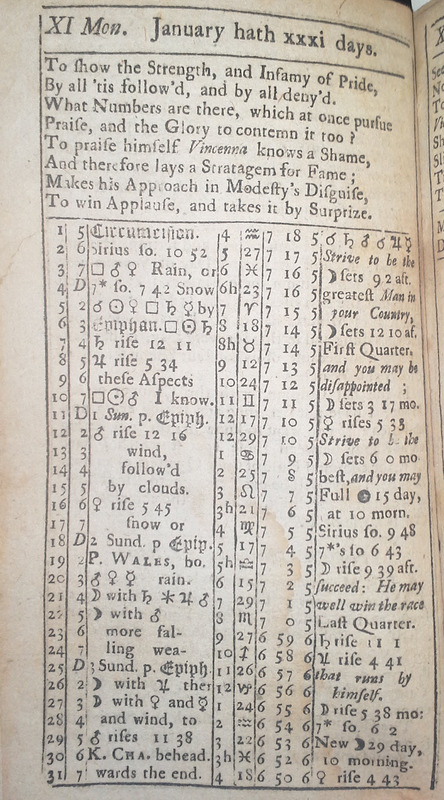 Arguing against the attribution is the fact that the manuscript contains the lunar tables and almanac for 1747 indicating likely creation in 1746 when Rittenhouse would have been only 14 or 15 years old. The only substantial collection of Rittenhouse astronomical manuscripts is at the American Philosophical Society which holds three of his notebooks from the last quarter of the century. A look at the handwriting in these neither convinced me nor completely dissuaded me from the attribution. That Rittenhouse could have composed or copied a set of lunar tables and almanac as a teenager is not necessarily as far-fetched as it seems. Later reports of his early years noted that at the age of 14 many of the fences and plows with which he worked were covered with notations and mathematical formulas, by the age of 17 he had even constructed a fully functional clock by himself . Another, somewhat more likely possibility is that the manuscript is a copy or partial copy of a printed almanac circulating in the period. The chart for the month of January, for instance, is very reminiscent of the print almanacs of the time – beginning with an aphorism or epitaph followed by a series of predictions and notes about the days of the month. Given this, I think it likely that at least part of the text was copied by a young Rittenhouse (or someone else) from a printed almanac. There were at least four or five different almanacs printed each year in Philadelphia with more in New York and Boston. What’s interesting and remarkable is that the text in the manuscript does not match any of these surviving American almanacs for 1747 that I have been able to locate. Of the almanacs likely to have printed in Philadelphia for that year, only one has failed to survive in any copies, the Franklin-published 1747 American Country Almanac which has never been traced . From the description of the New York issue of the American Country Almanac for that year which survives in one copy at the Huntington, it seems unlikely that this is a copy of that particular text . 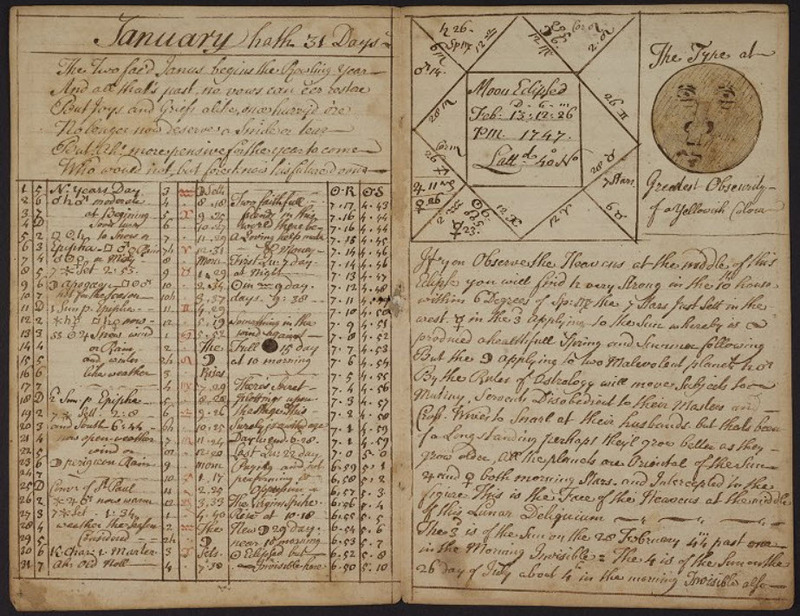 January, from Poor Richard’s Almanac for 1747. Printed by Franklin. UPenn Curtis 345. 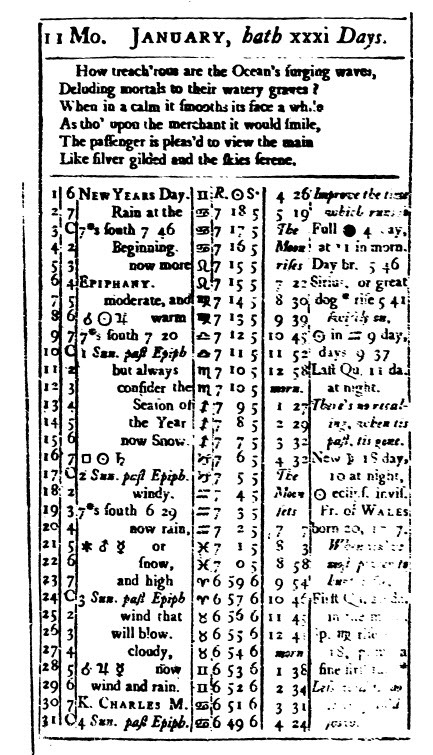 January, from the Philadelphia Pocket Almanac for 1747. 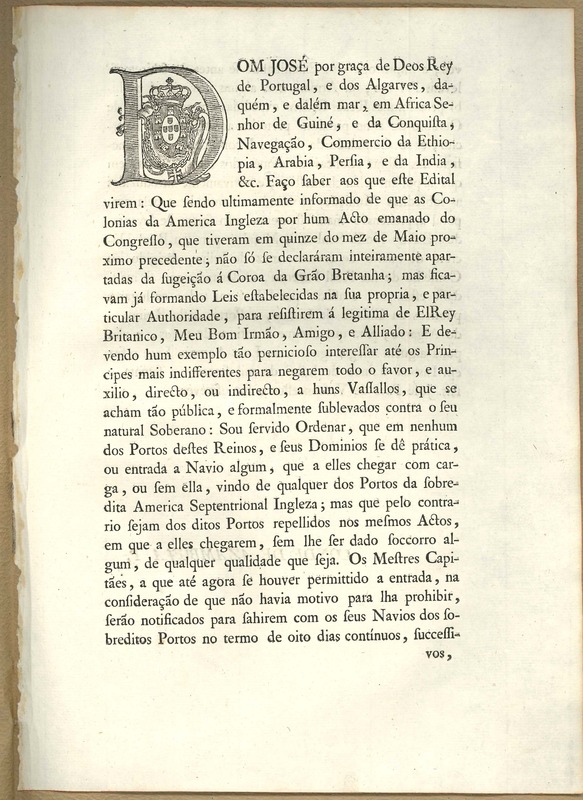 Printed by Franklin. UPenn Curtis 161. One of the pleasures of working in libraries is acquiring manuscripts like this one, about which much remains unknown. 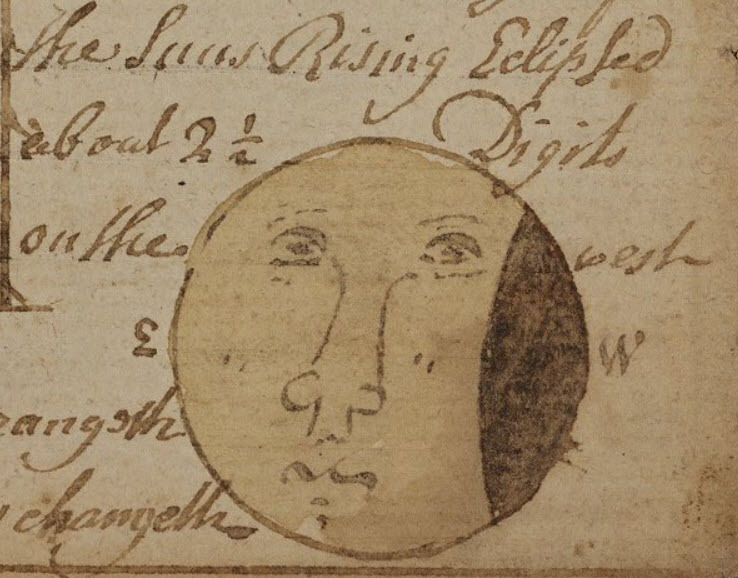 I hope that this post generates interest in the manuscript and inspires a student or researcher to take a closer look and delve into its origins and what it might be able to tell us about astronomical commonplacing and almanac creation in colonial America. For two recent excellent pieces on the place of Almanacs in the early American world see, Patrick Spero, “The Revolution in Popular Publications: The Almanac and New England Primer, 1750—1800” Early American Studies, Vol. 8, No. 1 (Winter 2010), pp. 41-74 http://www.jstor.org/stable/23546600 and Matthew Shaw, “Keeping Time in the Age of Franklin: Almanacs and the Atlantic World,” Printing History 2 (2007). See the Memoirs of the Life of David Rittenhouse (Philadelphia, 1813), p. 96. In his survey of Franklin’s printing, Benjamin Franklin’s Philadelphia printing, 1728-1766 (Philadelphia, 1974) [no. 392] Clarence Miller lists this as possible but doubtful based on the fact that though Franklin-issued copies of the American Country Almanac survive for 1746 and 1748, he did not advertise one for 1747 and the New York copy at the Huntington does not have Franklin’s tell-tale anatomical woodcut. With many thanks to Vanessa Wilkie and Steve Tabor at the Huntington for their help with this. When acquiring early manuscripts these days libraries mostly get them one at a time. A 15th century medical compendium here, a cache of Mexican inquisition proceedings there. 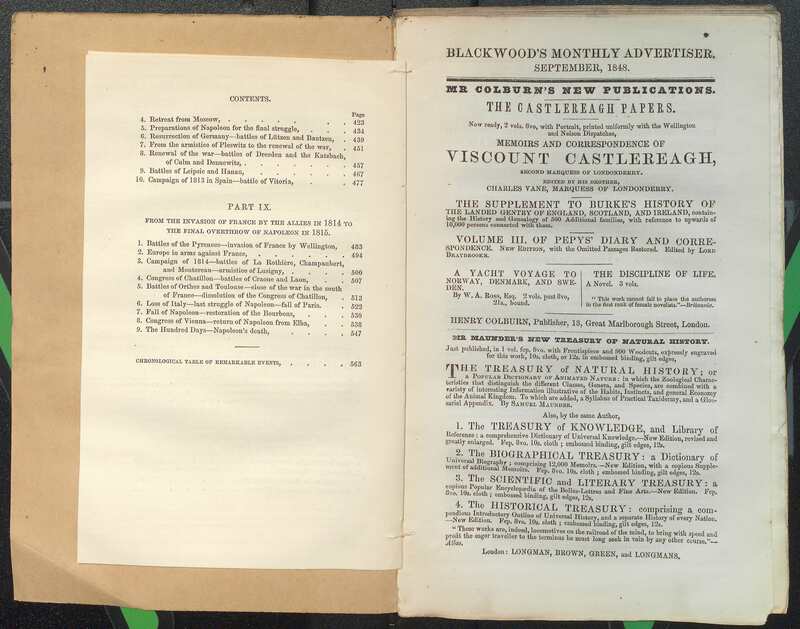 It was with excitement then that my colleagues and I read the catalog for the sale of some of the 12th Duke of Northumberland’s collection this past July. Amongst the treasures was a somewhat unassuming lot consisting of nearly 60 manuscript volumes from a single 18th century collector. 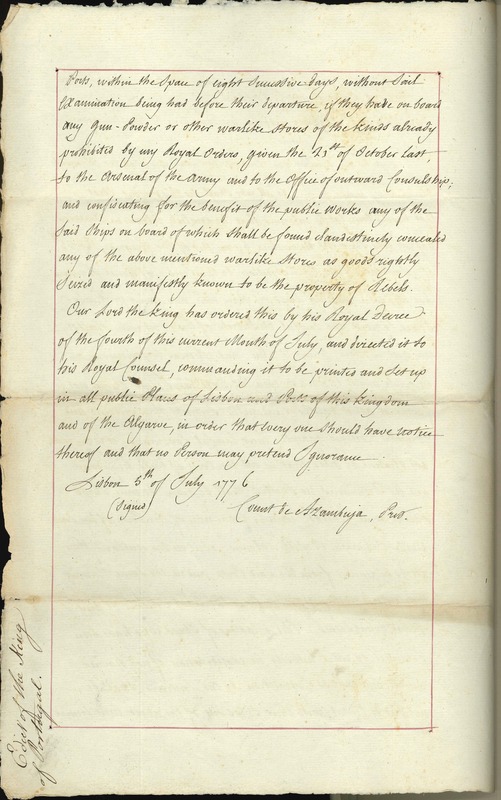 These manuscripts had been left to the 2nd Duke of Northumberland by his friend Charles Rainsford (1728-1809). Alnwick Castle, Northumberland. Photo by Fiona James (CC-BY 2.0). Flickr. 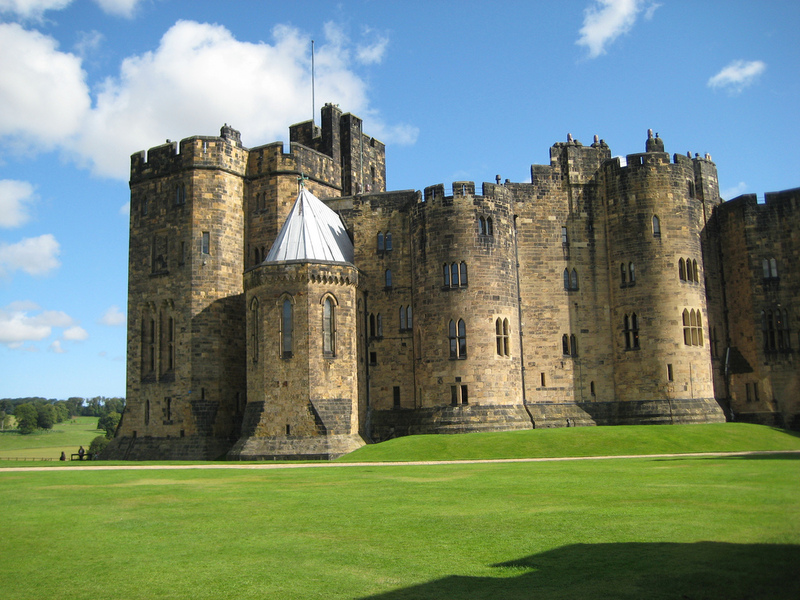 Since 1809 they had sat on the shelves at Alnwick Castle, seeing only sporadic use. Rainsford was not only a British general and sometime governor of Gibraltar but an avid alchemist and occultist, fascinated by everything from the philosopher’s stone to Tarot to Rosicrucianism. The manuscript library he left to the Duke of Northumberland contained works he had collected in Gibraltar and on the continent but also a number copied out in his own hand from texts he had seen or borrowed. As Penn has long been a major collector in the history of science, especially that of chemistry and alchemy, my colleagues and I thought the opportunity to acquire an entire manuscript library was too good to pass up. Thanks to the generous support of the B.H. Breslauer foundation as well as several endowments here at Penn we were able to be the winning bidder when the collection was sold at Sotheby’s. 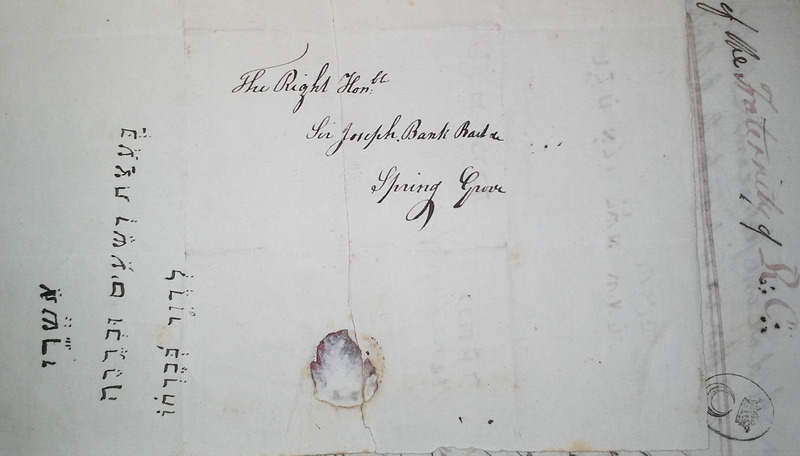 Note addressed to Sir Joseph Banks found in UPenn Ms. Codex 1684 (formerly Alwnick Ms. 595). The Rainsford collection physically arrived here at Penn in the fall and sits together as it did for decades at Alnwick. Indeed, more than any volume in particular the collection probably has its greatest value in its whole as an almost fully intact 18th century manuscript library, representing the accumulated learning of an emblematic gentleman scientist. All of the manuscripts in the collection have been given very brief records in our online catalog and are available to researchers now. In addition, however the next year our fantastic cataloging staff will be working through each volume to provide comprehensive descriptions of their contents [Here’s an example of one already completed]. As readers of this blog know, I like to always do a July 4th post about something related here at Penn. However, instead of picking a particular item or collection as in previous years I thought I’d dip into our rich collection of more than 100 manuscript diaries and journals for some first-hand accounts of Independence Day over time. Rather than trying to intentionally pick those diaries which might yield the most interesting results I chose from the collection more or less at random to get a few glimpses of how everyday people celebrated or experienced the 4th. Most of our diaries here date from the nineteenth century with a concentration towards the end of the century but otherwise span a wide range of places and writers but I’ve limited the selection here to only those writers who were American as they were the most likely to observe the holiday (I’ve also tried to keep spelling close to the original). To day is the eighty sixth anniversary of the Independence of the United States. Clear beautiful day. Flags flying from all the Frigates and shipping in port. Everything on board as on any other day. At 12. Fortress Monroe commenced fireing the National salute, 34 guns, The Minnesota following, then the Cumberland, Commodore Pendergast’s Flag Ship. We have cake made. Made ice creams. Big White – mother of turky – they are 4 weeks today – laid one Egg. She is Patriotic. 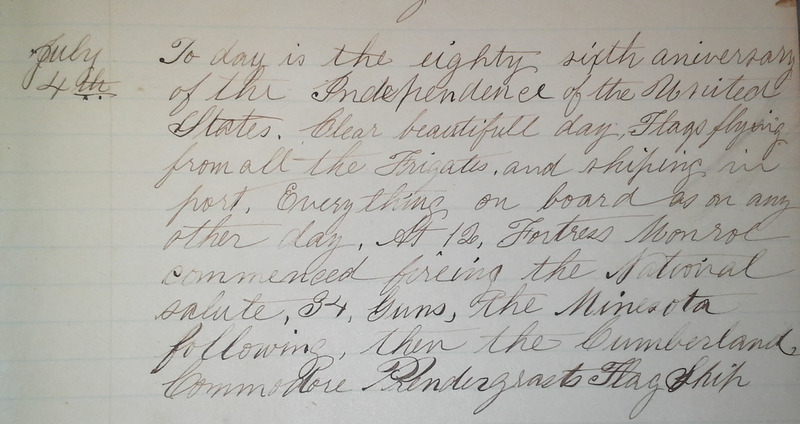 What a contrast between this day and the 4th of July 1861 – that I spent in old WmsBurg and in the evening made down to the Battery for the first-time, saw the 10th Ga. Regt. on parade, to-day I am in the disagreeable City of Lynchburg, very sick. I’ll not complain however as I have my husband and mother with me. I am thankful for my blessings. The 4th of this month always makes me feel sad but brings back the good old times at home, I don’t like to think of a anything connected with home, it so sadly changed. Three years ago today. I went down to Fort Magruder near Williamsburg for the first time. Cousin Hattie, Sallie & I drove down late in the evening, was quite a pleasant time…I wonder if the good old times can ever be restored again – never for me! Today we celebrated Independence Day in rather an unusual way for us. We got up at seven and after a bath and breakfast – finished under the watchful gaze of half a dozen curio dealers we had a lunch put up and made an early start for the temples. Though none of the sentiments and brief observations above are of any major interest individually I like to think of the diary collection as ripe for investigation of daily life across space and time. All the extant 19th-century diaries put together wouldn’t come close to recording the number of life experiences as a single minute of contemporary social media which makes what we take to be the mundane observations in these varied texts all the more rare and personalized. In 1761, Pittsburgh was only a few years old and had a population barely over 250. The first printing press and locally printed book didn’t come to the city until after Independence in 1786. Given this fact and thanks to the sleuthing of the Italian bibliographer Marino Parenti, we know that this book is in fact part of a larger four volume series printed in Milan by the Agnelli family between 1761 and 1768, all of which were given a false “Pittburgo” imprint . It’s interesting to speculate about what Italian readers thought when they saw the name of such a remote and marginal town on the title page. 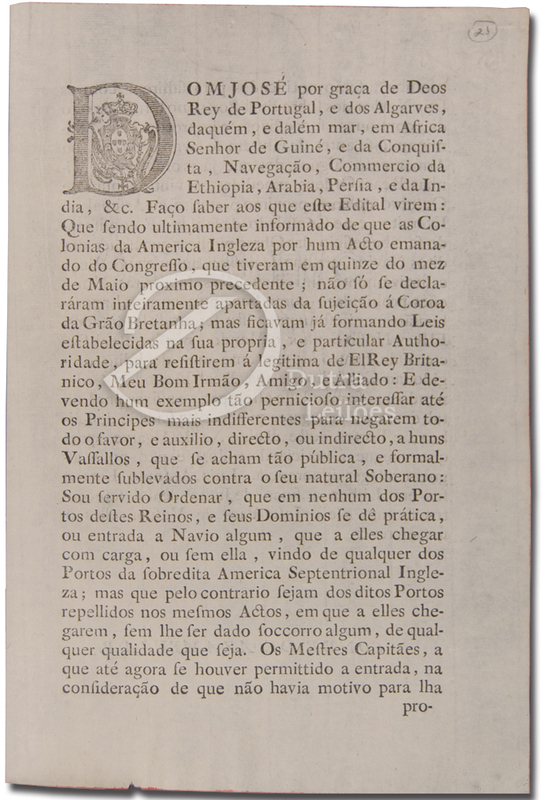 The text of the book itself consists of a number of letters recounting travel and conditions in Spain – why not give the book a false imprint from a Spanish city then? I can’t answer any of these questions with certainty but I like to think that Agnelli chose Pittsburgh to give a hint of the exotic. Pittsburgh and what is now western Pennsylvania likely figured in Italian news accounts of the Seven Years’ War and it would have appealed as an up-to-date reference for those in the know – something akin to how the name of the city of Timbuktu has often been used in Europe as a metaphor for remoteness. So while we can’t claim to have the first book published in Pittsburgh, I think this little volume is fascinating for showing a hint of how European readers and publishers must have viewed North America in the eighteenth century. For more on false imprints see a wonderful recent piece by Shannon Supple at the Clark Library as well as a series of visualizations of select false imprints that I created last year. The entire set has been digitized by the University of Illinois and is available through HathiTrust. 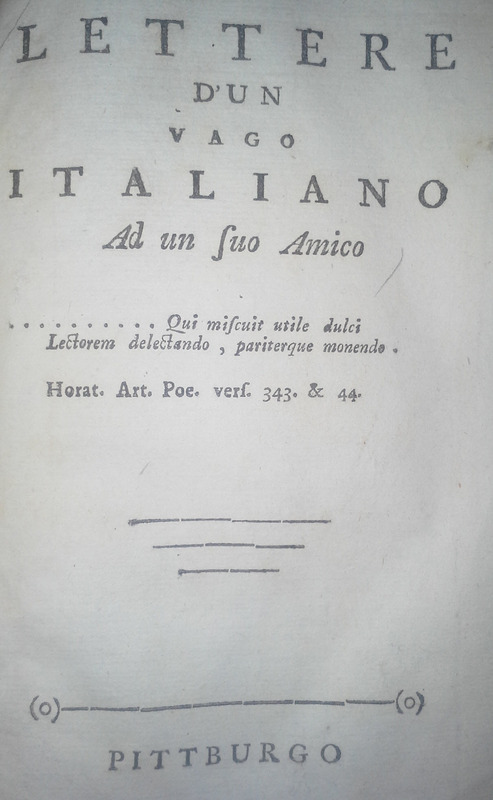 Note that the fourth volume includes a second title page giving the place of publication as Lucca. 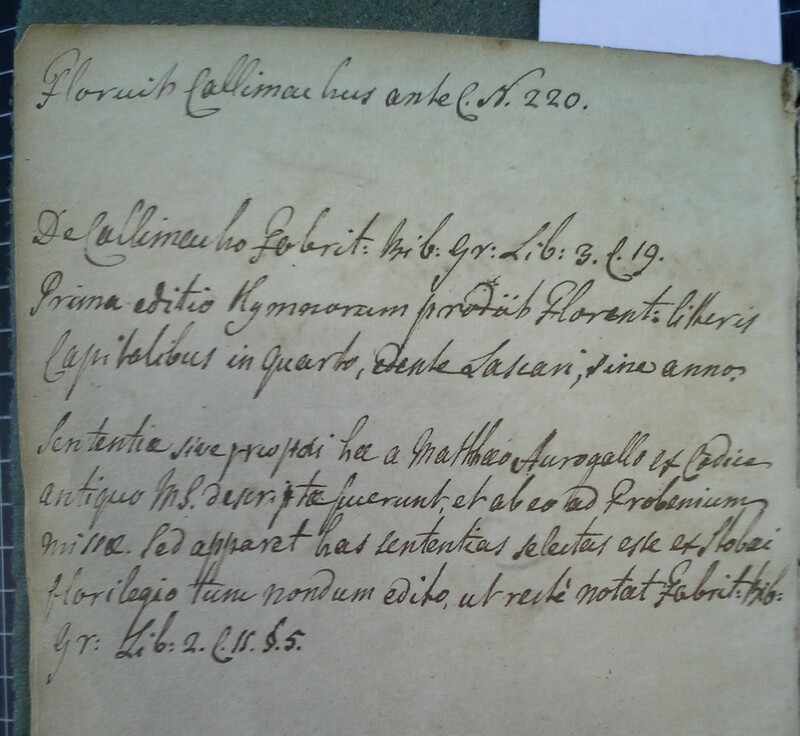 Two weeks ago, the Penn Libraries hosted the annual Rosenbach Lectures in Bibliography featuring the book history scholar Ann Blair who has done fantastic work on the history of annotation and reading practices. Inspired by Blair’s lectures I thought I would share a new acquisition here at the Kislak Center. My colleagues and I spotted this item at auction recently and we were able to acquire it in January. A 1532 Froben edition of the Greek poet Callimachus,our interest was primarily based on the prior owner of the book, James Wilson, a signer of the Declaration of Independence and founder of the Penn Law School. Wilson (1742-1798) was born in Scotland and moved to Pennsylvania in 1765 when he was 23. He went on to become a successful lawyer, inaugural law instructor at the fledgling University of Pennsylvania, early American patriot, and one of the first justices of the new United States Supreme Court. For all of Wilson’s importance and his role at Penn, until acquiring this volume we held no books identified as being in his library . Wilson came to the North American colonies in the fall of 1765 and quickly became a tutor in classics at Penn. This volume is of special interest then as it dates from the first year of his time in Philadelphia. I have to especially thank our brilliant cataloger Liz Broadwell for her insight into Wilson’s inscription. What I had assumed was some corruption of “Ejus Liber” (his book) she masterfully read instead as “Ejus Lebetes” referring to a kind of Greek pot often presented as a prize (also a quote from the Vulgate Leviticus 27:3). This kind of classicist pedantry is just the kind of complicated allusion that would appeal to a young Greek instructor struggling to teach his students the ins and outs of a 4th century BC poet. After his time at Penn Wilson of course became one of the first U.S. Supreme Court justices but the last few years of his life were difficult ones and he died a debtor in 1798. In the course of settling his estate Wilson’s administrators sold his possessions to the highest bidder. Last week I went to look through this rather sad list of sales in the records of the Philadelphia register of wills . Among the lists of old linens, and a judicial robe sold to Samuel Chase is an inventory of Wilson’s books. Unfortunately the Callimachus described here is not on the list, perhaps sold earlier or retained by a family member, indeed the list of books sold consists almost entirely of legal works. Entry for $17 received by the Wilson estate for his judicial robe (Philadelphia Administrations 1799-66). given the state of the annotations that they were intentionally washed by a later owner or book dealer, perhaps in the 19th century. Whereas in its original state, and indeed to Wilson in 1766, the book had value primarily as an excellent Greek teaching text, by the 19th and 20th centuries its value shifted to its association with Wilson and a new focus and fetishization of the signers of the Declaration of Independence. It’s truly exciting to have this volume and its many layers of use in the collection and I hope it will inspire interest for generations of students to come. Papers related to Wilson’s estate are available at Philadelphia City Hall as Administrations 1799-66 (James Wilson). They are in extremely poor condition and covered with black mold. Photostatic and later photocopy surrogates are also available in the file. 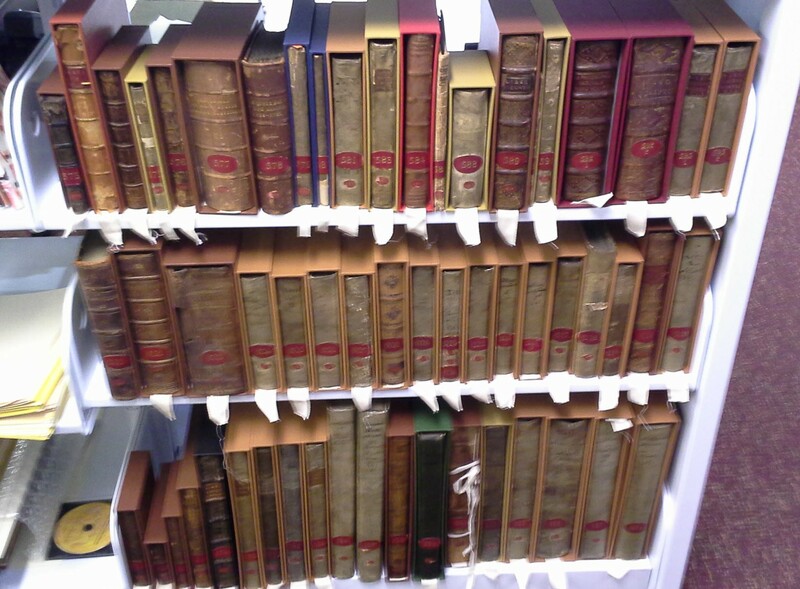 I have made a preliminary transcription of Wilson’s books from this inventory available. For a brief biography of Duncan see Sprague, Annals of the American Pulpit (1869), pp. 145-6. Autograph letters, manuscripts and rare books, the entire collection of the late John Gribbel, Philadelphia (New York: Parke-Bernet Galleries, 1940-45). For years scholars (including many from Penn!) have reminded us that print and manuscript cultures are far from exclusive. 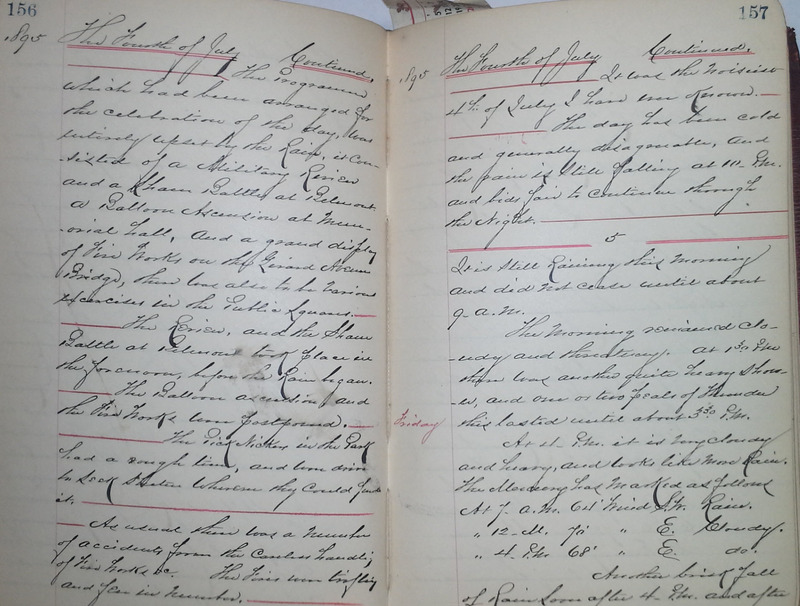 Printed forms with handwritten additions, handwritten diaries within printed borders, printed books interleaved with as much manuscript as printed text, are just some examples of this inter-mixing. Despite this knowledge though, I’m always delighted to find print nesting within what we tend to describe as manuscript and vice versa. I was browsing through one of our eighteenth-century manuscript commonplace books (UPenn Ms. Codex 782) a few months ago trying to identify the text when I noticed several printed pieces pasted onto the endpapers and rear board of the manuscript. I snapped some pictures and moved on. Later, looking back at the picture and reading the text, I realized we had two remarkable and unique pieces of print. UPenn Ms. Codex 782. Rear pastedown. 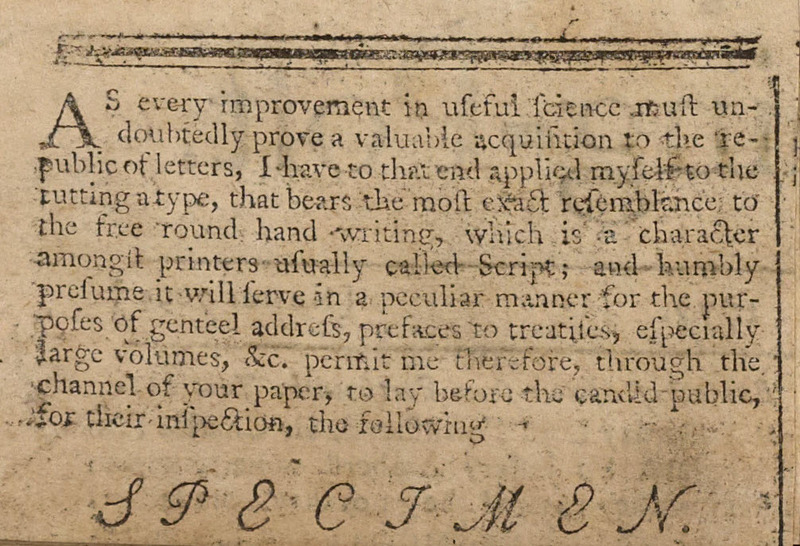 The first of these is a handy guide to arithmetic and weights and measures engraved by William Chinnery in 1744 . It was “design’d to be bind up with Cyphering Books” to assist a scribe with difficult calculations and to serve as a reference. 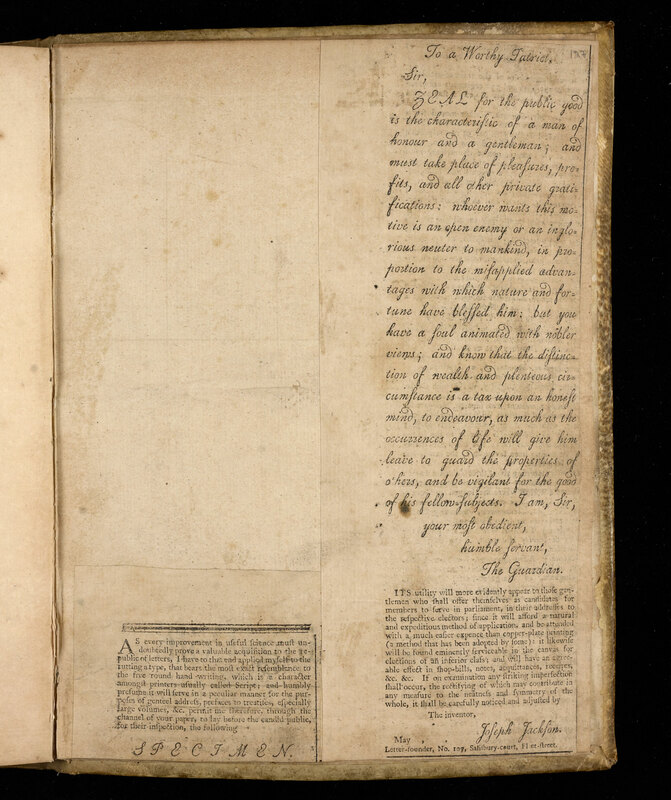 Given the dual content of this manuscript book, primarily a copied text of the Philosophical Transactions but with accounting leaves excised at the end, it’s possible that it was sold with the printed Chinnery sheet already pasted in. An unrecorded engraved sheet doesn’t come around every day but I found myself even more fascinated by the second set of printed inclusions pasted in the manuscript. 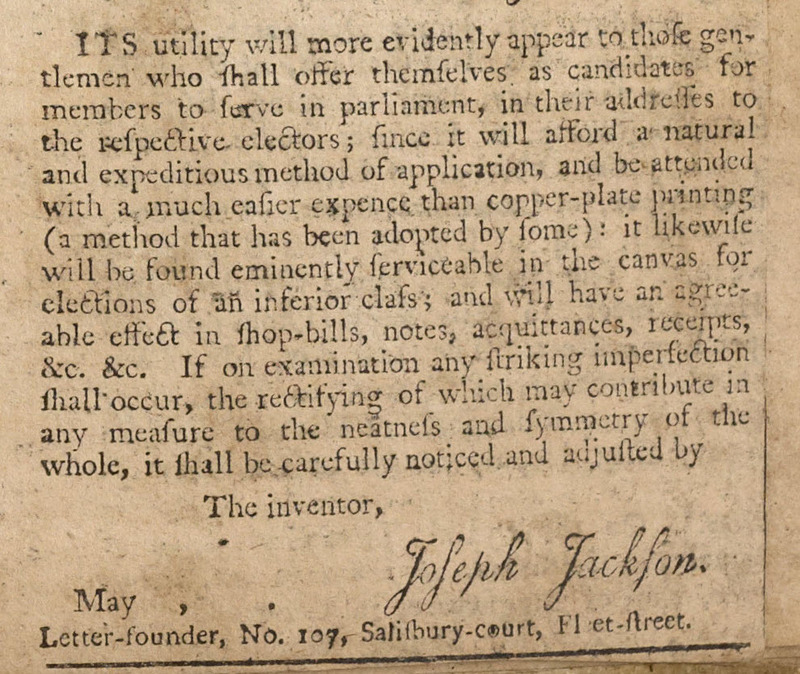 What first appeared as newspaper clippings turned out to be a typefounder’s advertisement or specimen. In the age of digital fonts and typesetting we often take for granted what a big deal a new type design could be in the hand-press era. In other words, type had to be physically created and designed mould by mould. This particular type specimen comes from the type founder Joseph Jackson (1733-1792) who was especially known for his development of new typefaces to print Persian and Devanagari scripts, reflecting the growing interest in disseminating works in those languages from the British territories in South Asia. 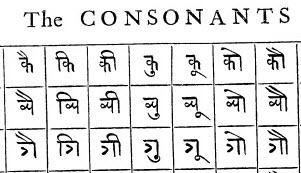 Specimen of Devanagari type published by Joseph Jackson in 1785. ESTC T193655. 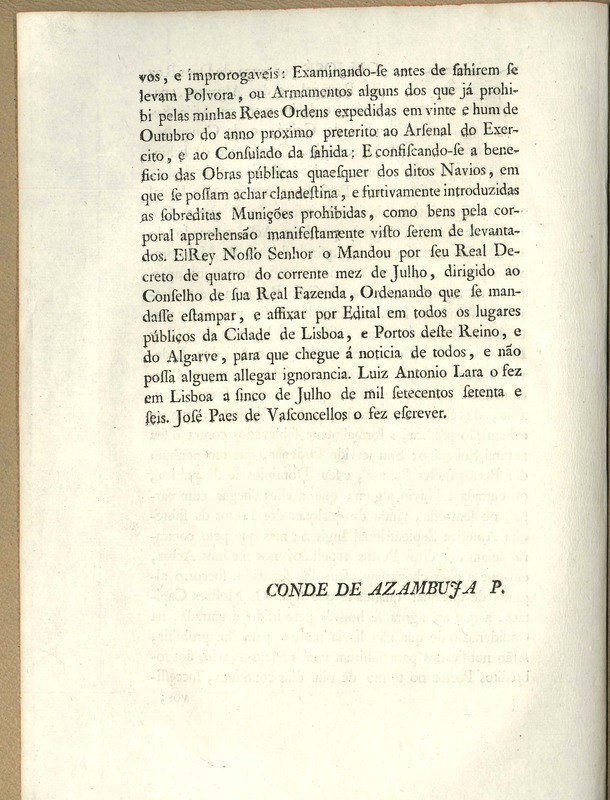 Cambridge University copy (ECCO).